Joe Pass is often considered as the greatest jazz guitarist who ever lived. The ability to play in solo, duo, and ensembles with ease, as well as move between single notes, bass lines, and chords, made him a true virtuoso. When studying his playing, one concept that is essential to spend time on is Joe Pass’ chord concepts. 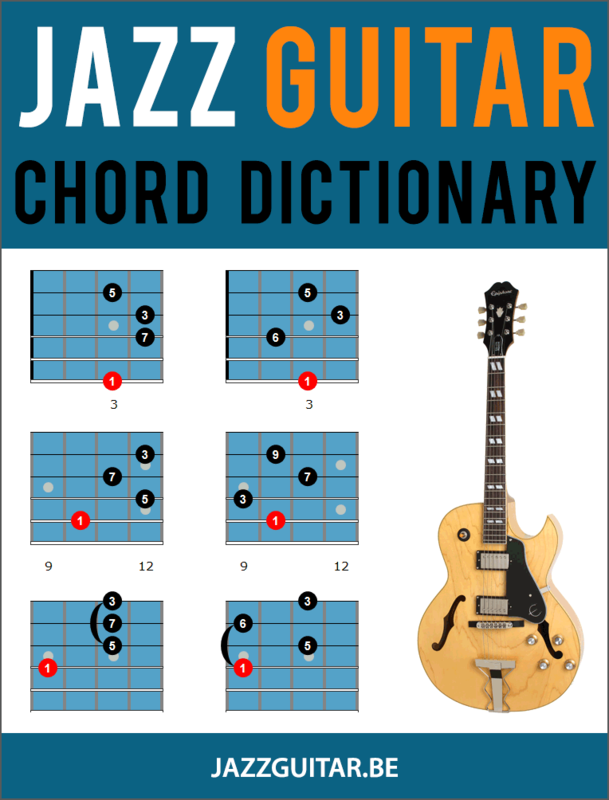 By studying classic Joe Pass chords and chord phrases, as well as breaking down the concepts behind those lines, you will begin to bring a Joe Pass vibe to your own jazz harmony. In this lesson, you’ll break down 5 classic Joe Pass chord licks, analyze the concepts behind those licks, and learn how you can take these lines and concepts into your own comping and chord soloing. As well as learning the Joe Pass chord licks below, you will want to take them further in order to get the most out of your studies with this material. • Learn the lines in the given key. • Move the lines to other keys. • Apply the lines to your comping/chord soloing over standards. • Work the lines at various tempos. • Apply the concepts behind each line to your playing. • Write your own lines using the concepts of each example. This first Joe Pass chord line features a classic walk-up phrase over a ii V I chord progression in F major. The chords walk up both diatonic and chromatic shapes, creating interest and movement in the line over the common chord progression. As you work through these chord lines, take any concept or sub that you like, such as playing Bbmaj7 over Gm7, and expand upon that chord concept. In this next chord phrase, you’ll see diatonic chords used for each change in the progression. A typical Joe Pass bassline and rhythm are used to create interest. The line uses chromatic notes to connect the chord you’re on, to the next chord in the progression in a typical Joe Pass fashion. You can see an example of this with the C# connecting the Fmaj7 to D7alt chord in the first bar of the line. The 8th-quarter-8th rhythm for each chord is something you’ll find in Joe’s playing, especially his solo guitar output. In this chord phrase, you’ll use a very typical concept that Joe uses to outline minor ii V I chord progressions. The first chord is Dm7b5, and Joe plays Dm7b5 for that chord change. Then, over G7alt, you move the Dm7b5 chord up a minor 3rd to Fm7b5. From there you move down to Ebmaj7 over Cm7, creating a rootless Cm9 chord in the process. If this concept is a bit over your head for now, no worries, learn the phrase and practice applying it to your comping and chord-soloing. If you’re able to grasp the concept with confidence, practice applying it to your comping and chord soloing over jazz standards. Another common Joe Pass rhythm is the triplet, with the bass notes on the first and last note of the triplet and the chord placed on the middle beat. You can see an example of this over a descending ending in F major below. Though you might not use this progression very often, you can take the concept out of this line and apply it to your playing, especially when ending a tune. After you’ve learned the example, take any tune you’re working on and play each chord with the triplet bass-chord-bass rhythm to apply this concept to other musical situations. This final Joe Pass chord example is a more advanced ii V I phrase in C major. Take your time with this line, as it will pose some technical challenges. Notice the rising chords in the first two beats, followed by the repeated chords to finish out the line. Playing a chord twice, such as from the second half of bar 1 to the second half of bar 2, is characteristic of Joe’s playing and something you can take into your own comping and chord soloing ideas. For me this lesson fills in some blanks, for sure. Such a good teaching method you guys have. Thanks much. I will look for ways to repay the favor. This is excellent help. Top quality and totally authentic. Please keep this standard a coming. I’ll be checking the site for more of this quality. You know, Joe pass certainly didn’t invent the cords, but he sure could put them together like no other guitar player. Very nice indeed, a Joe Pass lesson book would be a wonderful addition to your lesson collection……hint hint!! Great lesson! I’m obsessed with Joe’s playing, and you really present his “good stuff” so pedagogical (his own books is quite messy). I love the way he uses the most common chord voicings to build this panorama of harmony and colour. Genius, to say the least! Le tue lezioni mi aiutano tantissimo nella mia conoscenza dello strumento e del suo linguaggio. Grazie Matt. In example 3, Fm7b5 over G7alt, which is more correct, to think of the Eb as a b13 or #5? Hey Greg. Either will work. I prefer b13, but that’s just how I visualize that chord. Go with what works for you. Cheers. Thanks so much for your online lessons and instructional interactive e-books. I am a much better jazz guitarist because of them and enjoy all your lessons immensely. Another outstanding effort Dirk. Thanks so much for the lessons. Joe Pass was an amazing musician, I saw him once in Okla City a long time ago. You could have heard a pin drop when he was playing. Needless to say he was fantastic that night. I’ll never forget it. i really enjoy your lesson.THANKS.what i would like to see is grid diagram on the chords.it’illustrate easier and can memorize better. I am one of the lucky ones who was able to catch JOE PASS live 3 times in concert. once up close and personal in a very small venue that will last in my memory cells after all else has faded away. I really enjoy your Joe Pass lessons. Keep them coming. “channel’ what he knew, in search for my own style. Working so beautifully for vocal accompaniment. Muy interesante este material que me han enviado. Muy util para el estudio. Estoy Agradecido. Great lesson, Dirk. Thank you again. Though I have to admit, some of the 4 fret stretches (e.g. Em11b5) are a little tough for me! I was working in a guitar booth at the NAMM show in Anaheim in ’92 (’93? ), across from the D’Aquisto booth. Joe and Jimmy D. were great friends, and as Joe came down the aisle to Jimmy’s booth, heard me playing all by my lonesome. He sat down, grabbed a guitar, and we played Stompin’ At The Savoy! Well, he played and I shook, would be more accurate. He said, “sounds good, man”. He could have embarrassed me at any minute, but he was only interested in the music. It was obvious his health was failing by then. What a memory!